Those who know me know how much I love Ramen. 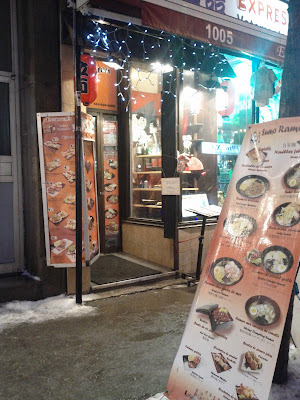 That's why Ramen-Ya has been my favourite restaurant in Montreal for so long. 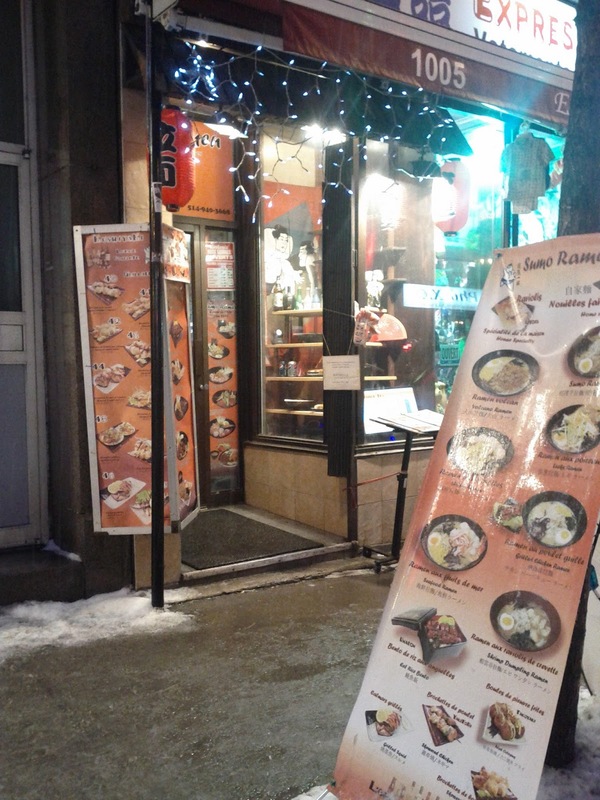 It has been pretty much the only place that served ramen in Montreal for a while as far as I know. Recently, this dish started to become increasingly popular. New restaurants that specialize in that dish started to pop up here and there. I've been paying close attention and I've found a few places through word of mouth from the most random people. One of them, located on Stanley street and that I have yet to visit, I heard about from a sales guy at a digital camera shop in the Place Montreal Trust shopping mall. He told me he tried it for the first time in Japan and had been looking for a good place here that served it and that was his spot. I think I might go try it out sometime soon. 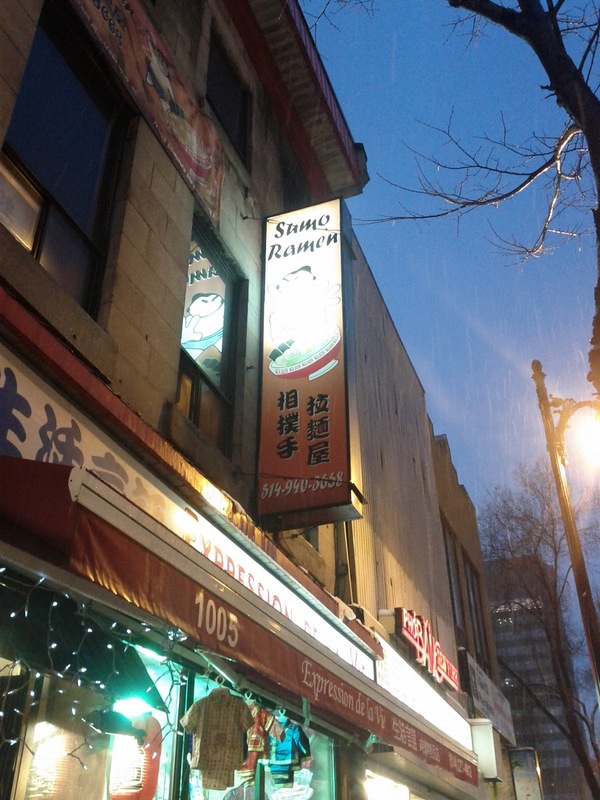 Another place that I heard about through god knows what source is a restaurant in Chinatown called Sumo Ramen. I have been meaning to go there for a while and last weekend I decided to stop by for a quick meal before spending the night at a friend's place. My impression was already made before I even got there. I thought that it wasn't going to be authentic. I mean it's called Sumo Ramen. It sounds cheap and cliché as hell. Also, if my experience eating in cheap cliché restaurants in Chinatown has taught me anything is that the food is going to be pretty mediocre. But, you can't judge a place before trying it out. Sometime, you can get pleasantly surprised. I got there pretty quickly. The restaurant is above some sort of souvenir shop and the entrance wasn't very big. If it wasn't for the signs on the sidewalk I would've totally missed it. I went up and asked for a table. I sat down and looked around to check out the decor and the customers. The place looks alright. It was bigger than I expected but, it felt very crowded because the tables were all close to each other. The decor was obviously inspired from a traditional Japanese house, but it wasn't too much. As for the crowd, I just found out where all the otaku nerds go for dinner on a Saturday night. You couldn't miss them. Teenaged, greasy haired anime nerds with Totoro hats and t-shirts with characters from Ano Natsu de Matteru or some unknown anime that no one's ever heard about, talking about the latest episode of Naruto. (Naruto is okay though, I watch it every Saturday morning with my breakfast right before I watch Adventure time.) So yeah. This was it. The place where all the anime fanboys and fangirls go to eat the favourite meal of one of their favourite anime character. For the record, the first time I heard about ramen was back in the late-90's while watching a Japanese repertoire movie called Tampopo. I heard about it way before it was cool. So I'm the ramen hipster. Seriously though. If you can get your hands on a copy of the Tampopo movie, I most highly recommend watching it. It is the most fascinating foodie movie you will ever see in your life and I guarantee that at the end you will be hungry. So I was sitting at my table and looked at their menu. It had a good variety. Especially for the appetizers. They had lots of tiny little servings of finger foods to share with friends. As for the ramen, they had only three kinds of broth: soy, spicy and miso. They had three home specialty ramen bowls that you could choose from or select your ingredients to make your own combination. One thing I was really excited about was that according to the menu, the ramen noodles were home-made. So, I picked some fried pork dumplings (gyoza) as an appetizer and the volcano ramen. 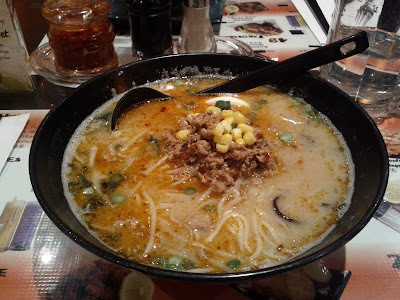 The volcano ramen is a miso soup with noodles, spicy ground pork, corn, green onions and mushrooms. Sounds good. After a while I got my dumplings. I was a bit surprise because they came all stuck together to a ribbon of what I could only imagine could be fried rice paper. The dumplings were good, but lacked flavour. A little while after I got my soup. At first sight it looked pretty plain. I mean even I made intant ramen soups that looked way better than this. Also, the smell is very important. I know what good ramen should smell like, but this one kind of just smelled like bacon. I started by tasting the broth. It was surprisingly good. Actually, I've never been a huge fan of miso, but this one was delicious. The pork, like the dumplings, lacked a bit of flavour. It could've used just a tiny bit more salt. The most disappointing part though were the noodles. They just looked, tasted and felt like spaghetti noodles. Anyway, I was a little disappointed in the quality, but overall it was alright. It was a good soup and I ate the whole thing to the last drop. I've heard people say this place was authentic, but I strongly disagree. I've been to the very famous Ippudo in New York which is famous for having the best ramen this side of the hemisphere and, frankly, Ramen-Ya is, so far, the closest thing I've ever tasted to the real authentic stuff. Sumo Ramen was what I expected after all. It's not bad, but it's not excellent either. I might drop by sometime for a quick lunch since I work close by, otherwise I'll stick with my usual spot.